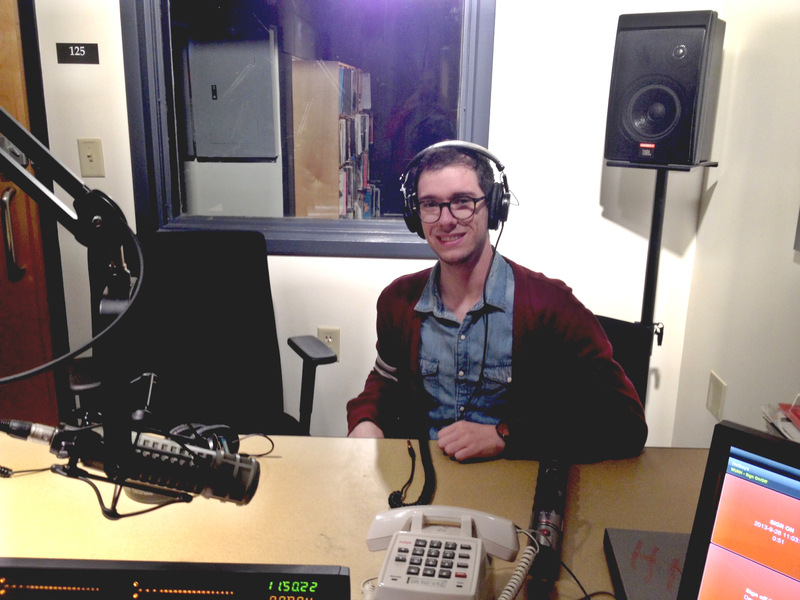 Student DJ Harry Wolfson, sits at his desk in the WUNH studio. This is his third year at WUNH. As a freshman, Harry Wolfson agreed to accompany a friend to the bottom floor of the Memorial Union Building, where the college radio station was holding an information meeting for new deejays. Though he had always loved music, Wolfson had no experience working with a radio station before. Today, the UNH junior is in his third year with WUNH, taking over the airwaves every Thursday morning with his weekly show “DJ Harry vs. the World.” Sitting in the front room of the station this past Thursday, Disc Jockey Harry was enthusiastic and open in discussion of his show and his time with the station. “It’s mostly indie-pop and electronic stuff,” Wolfson said of his show, which he’s run since being trained as a deejay his freshman year. Recently, Beach House, Grimes and FKA twigs have been some of his favorite artists to play on air. With almost 50 DJs doing regular shows and others covering sporting events and specialty shows, this is no small undertaking, but Wolfson seems to take it all in stride. As a prominent member of the executive board, Wolfson takes pride in the station and all it accomplishes. He noted the station’s “tier four” rating among college radio stations, saying that they have one of the widest ranges of any college radio station in New England. Wolfson also emphasized the responsibilities that come along with working with the executive board of such a large student-run organization. “We operate as a business, not an organization,” he said. Helping run this business-like student organization comes with many serious duties. Wolfson also referenced the more enjoyable aspects, such as putting on student events with the station. One such event is the upcoming Halloween Bash in the Granite State Room on Oct. 24. Whether he’s acting as DJ Harry or program director, Wolfson enjoys his time with WUNH. He confessed that the DJs and board members are like a little community unto themselves, full of firm friendships.